We are comparing Mallorca Evening Culinary Tour through Palma Prices from leading ticket suppliers and Try to find you Cheap tickets prices on the market. A three hour culture and culinary tour through Palma Mallorca stopping at some of the cities best sights, most popular landmarks and tastiest tapas bars. An immersive culinary experience that takes you into some of Palma de Mallorca’s Old Town’s best tapas bars. An opportunity to sample some of the Old Town’s finest gourmet tapas thanks to your knowledgeable guide. The tour is a great way to get your bearings of the city and, since it runs in the evening, it’s a wonderful way to enjoy the city at night. The tour is both educational and fun, and a little bit tasty thanks to all the local dishes you’ll be sampling en route. A chance to try local pinchos for the first time! A great way to feel like a local. This tour is perfect for friends and couples alike! The Old Town of Palma de Mallorca is home to some of the cities quaintest cobblestone streets, finest buildings and impressive architecture. It was once the islands commerce and economic capital back in it’s day, now it’s more akin to a sleepy Spanish town but it retains its charm and popularity. Perfect for large friend groups. Your Experience With Mallorca Evening Culinary Tour through Palma? Meet you guide and head out to spend the evening in Palma following their lead. 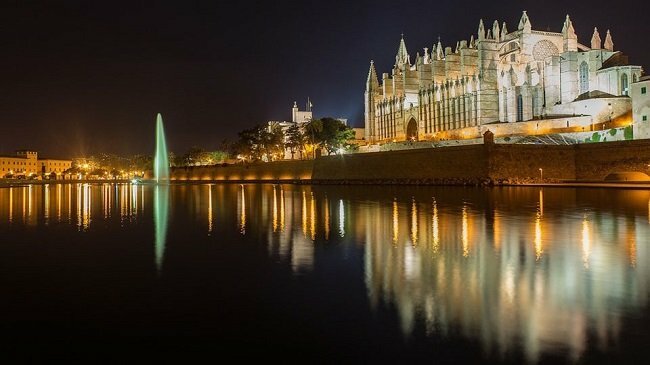 Enjoy the magic of Palma de Mallorca at night as you walk around the city learning about the local history, the towns architecture and spotting the best landmarks. Swing by the Almudaina Palace, take a picture infront of the Es Baluard Fortress and admire the Old Town Cathedral. Stroll down the Passeig del Born, stopping to take a peak in some of the luxury store windows, before continuing on to the Placa Mercat where you’ll admire the Grand Hotel. Immerse yourself in the Spanish way of life and enjoy the laid back Meditteranean vibes of the Old Town at night. While walking around the city you’ll stop off at different tapas bars to sample their best dishes including a variety of pinchos, tapas and deserts. Dine on delicious pinchos at the first tapas bar before moving onto the second and ordering an array of tapas dishes. You’ll enjoy a delicious, Spanish, desert board at the third and final tapas bar! What Mallorca Evening Culinary Tour through Palma Includes? Guided tour through Palma (in English or German). Wide selection of tapas dishes. Wear comfortable shoes for walking around the Old Town. Use this tour to test out your culinary comfort zone and eat something new! Travelers Reviews about Mallorca Evening Culinary Tour through Palma? Tickets booked through Get Your Guide can be cancelled for a full refund 24 hours in advance. Please arrive 15 minutes prior to the departure time to avoid delays. Make your tour company and guide aware of any food allergies in advance. Meeting point: Avinguda d'Antoni Maura 22 (close to Carrer de Vallseca).